You voted against Russell Vought because of his mainstream, historic, Christian beliefs. Then-US presidential candidate Bernie Sanders, backdropped by the dome of St. Peter's Basilica, listens to questions during an interview with the Associated Press, at the Vatican Saturday, April 16, 2016. On Wednesday, June 7, 2017, Sen. Sanders voted against Russell Vought, Trump nominee for Deputy Director of the White House Office of Management and Budget, because of his Christian beliefs. I write this letter to you with respect and concern. Respect because of your years of service to our country and your terrific campaign last year. Concern because of your grilling of Russell Vought, President Trump’s nominee for Deputy Director of the White House Office of Management and Budget, earlier this week. Frankly, sir, I found your exchange with Mr. Vought to be quite alarming, not to mention downright un-American. May I have your ear for a moment, Mr. Senator? Although I am registered as an Independent rather than a Republican, I am strongly conservative, and so disagree with much of your ideology. Yet when you rose to such national prominence last year, I found much to like about you. You were unafraid to put your beliefs on the table. You were plainspoken rather than rhetorical. You had a great following among the younger generation. You had no history of ugly scandals in your past. And you had great passion and vision, in particular for a man in his 70s. All this was impressive to me, and, in candor, I felt that the election was stacked against you and in favor of Mrs. Clinton. So, I bear no ill will towards you and I believe that you want what is best for America, as do I.
Vought’s beliefs mirror those of some of our past presidents, Supreme Court justices, and some of your colleagues. Yet you applied a religious test to Mr. Vought. On what basis? Are you aware, sir, that his beliefs mirror those of some of our past presidents and Supreme Court justices, along with the beliefs of some of your esteemed colleagues in Congress? Most importantly, are you aware that Mr. Vought’s beliefs are taken straight from the New Testament? Is it possible you misunderstood the meaning of these words? Could it be that you took them to mean something that Mr. Vought never intended? The answer for any Bible-believing Christian is simple. Yes, every human being stands condemned before God and in need of a Savior. That’s why God sent Jesus to die for our sins, and that’s why we send missionaries around the world to declare this message of salvation. May I give you the biblical context for this belief? I imagine that, somewhere in your lifetime, you’ve heard the most famous verse in the New Testament: “For God so loved the world that He gave His only begotten Son, that whoever believes in Him should not perish but have everlasting life” (John 3:16). For God did not send His Son into the world to condemn the world, but that the world through Him might be saved. He who believes in Him is not condemned; but he who does not believe is condemned already, because he has not believed in the name of the only begotten Son of God. And this is the condemnation, that the light has come into the world, and men loved darkness rather than light, because their deeds were evil (John 3:17-19, my emphasis). Did you note those words, Mr. Senator? The New Testament is stating clearly that all human beings stand condemned in God’s sight because we have chosen our ways rather than His. For that reason, He sent Jesus into the world, not to condemn us but to save us. That means that you, too, stand condemned before God, no matter how much good you have done. But you are not alone. Billions of others find themselves in the same predicament. The good news is that the same solution applies to all: trusting the Savior to forgive our sins and change our hearts. Do You Deem People of Faith Unfit to Serve? Are you saying, then, that anyone who subscribes to these historic Christian beliefs is not fit to serve our country, even as Deputy Director of the White House Office of Management and Budget? Does that not strike you as standing in fundamental violation of the very principles on which our nation was founded? Isn’t this a classic example of advocating for freedom from religion rather than freedom of religion? By your logic, not only would Mr. Vought (and as mentioned, quite a few of your colleagues) not be fit to serve, but a devout Muslim could not serve either, since Muslims believe that Jews, Christians, Hindus, and others must become Muslims to be saved. And what about an Orthodox Jew who believes that you, a non-observant Jew, are guilty of violating Torah and thereby sinning against God? Should that Orthodox Jew not be allowed to serve? Every human being stands condemned before God and in need of a Savior. That’s why God sent Jesus to die for our sins. What if Mr. Vought had answered your questions by quoting the words of Jesus? What if he said, “Sir, I believe in Jesus Christ, who said, ‘I am the way, the truth, and the life. No one comes to the Father except through Me.’” (John 14:6) Would you have replied, “Well, if you believe what Jesus said, you can’t serve our country.” Really? As a Christian, Mr. Vought would be duty bound to treat everyone with kindness, respect, and fairness, regardless of their religious beliefs. And as someone who loves God, he would be expected to love his neighbor as himself. This too is part of his faith. To the contrary, sir, he is what this country has been about since the days of our first settlers. And it is people like him— people of robust faith who genuinely care about others — who this country needs today. Perhaps, by now, one of your staff members has suggested to you that you misunderstood Mr. Vought’s statement and that, perhaps, you treated him unfairly. If not, I do hope you will take to heart what I’ve written here, humble yourself and apologize, and then evaluate this candidate based on his overall qualifications. If, however, you fully understood what Mr. Vought believed and for that very reason found him unfit to serve, then my concern is greatly intensified. You would then be advocating for an American that would become tyrannical and oppressive. And you would be declaring war on some of our most precious and fundamental freedoms. Is that really the America that you want, Mr. Senator? The real tragedy here is that possibly most of his supporters would not know or care to know this nations history or the principles it was founded upon well enough to even, like Mr Sanders recognize the fatal flaws in his argument. We don’t expect theologians from those elected to represent our nations interests. Nor do we expect an antichrist to do so either. So you’re all good with the fact that Vought defended firing a teacher in a Christian college because they expressed solidarity with an oppressed group who are not Christian on facebook? Where are Vought’s principals, if he thinks firing someone for being kind to their brothers is ok? because that’s totally unchristian of him. What your saying is that multiculturalism is superior to the exclusivity of the Christian faith ..
Again – I feel you ignore all my questions above, which I’ve spent a lot of time formulating. It’s frustrating…because it’s not a discussion unless you respond to what I say. But – I will again answer what you ask/say, and hope you will also address what I say above in return. I am not saying that multiculturalism is superior to the exclusivity of the Christian faith in my post above. Not at all. I don’t even think Christian faith is exclusive. I think that’s actually not true at all – e.g. the word ‘Catholic’ derives from greek words for ‘universal’, and directly refers to the tenet that all are created equal and are equal in the eyes of God. Jesus himself was a Jew, as were his disciples. The bible is full of instances where he was kind to people who were not Christian, especially sinners, and how he instructed us to do the same. One question above which I really feel you are deliberately avoiding answering, but which is central – is – are you OK with the fact that Vought defended firing a teacher in a Christian college because they expressed solidarity with an oppressed group who are not Christian on facebook? What if that christian teacher had washed a Muslim’s feet, by that logic? Crucify her? Where is the lengthy reply I wrote to this, too, one hour ago or so, which was also Christian-loving and polite? Who is moderating here? What’s your criteria for removing my posts in the middle of a discussion? I read your whole posting policy and stuck by it exactly. Really starting to think the problem was that I said all are created equal!! Please reply honestly!!! Yeah, my reply to an earlier reply was the reply to the reply whose disappearance is duly noted. I got an inactive response from Disqus when I tried to post my reply to your reply. Anyway ,”sh*t happens” & your comments, while not reflecting the position of the articles author or understandably the general consensus of most regular patrons of this site contained nothing deserving of censure . but I was enjoying the discussion and it’s an important one for me. Clearly, me just being a human with genuine beliefs are not sufficient credentials here. Thoroughly depressing. Thoroughly hypocritical. @disqus_63dEnwMHB9:disqus I would appreciate if you ever find an actual Christian site. I concur with your opinion here and many REAL Christians have had it with the faith being portrayed as one of hate and intolerance when that is the very OPPOSITE of what Jesus stood for. I find real Christians on facebook, but haven’t seen any publication/media outlet that actually comprehends the Golden Rule, Charity, Kindness, Stewardship, etc…just a lot of talk with very little walk. I’m so relieved to see at least one christian person agreeing with this basic tenet! Thank you, really. I find it sooooo depressing to hear hatred and condemnation for fellow man from people who claim to follow Jesus Christ. @Daralyn & @Fiona what is y’all’s response to Jesus stating that He is the only way to God? What is YOUR response to Jesus saying you should love and serve your neighbour, sinner or not, and you should not judge them? What is your response to ANY of the questions I’ve asked you on here above? Like – are you saying you think Vought was right to fire that Christian teacher for posting a message of kindness to Muslims on facebook? It’s a yes or no question, and it’s being dodged repeatedly. Why? I’ve asked you so many times now, and instead of just honestly answering a yes – he was right to fire her – or no – he was not right to fire her, you’ve been dodging it all the way. I told you that I don’t know the details of that incident and that it’s irrelevant to whether congress, represented by Sanders etc can apply a religious test. Keeping in mind that I am only going on your description of the firing, I am almost always going to be on the side of the individual posting on their own time, on their own private page. As far as Christ expecting us to love & serve others, I do my best to follow His will. And, He has helped me see others through His eyes. And, I live in joy following Him. He also expects us to tell the truth. And, the truth is that He is the only way to God. Telling that truth is the kindest thing anyone can ever do. So, I’ll ask again what your thoughts on His exclusive statement are. Look. It’s totally relevant – because in the exact conversation you say you’ve listened to, Sanders references and quotes Vought on this exact case of firing a Christian for posting a kind message to Muslims on facebook. Sanders NEVER said Vought’s faith made him unfit for office. He said Vought’s condemnation of ALL Muslims, and his willingness to fire a Christian woman for practising her faith in posting a kind message to her Muslim brothers and sisters on facebook. THOSE UNCHRISTIAN BELIEFS OF VOUGHT ARE WHAT SANDERS OBJECTED TO. NOT his Christianity, at all. Sorry for the caps but this point seems to be getting lost every.single.time. I reply to you. You have no problem denigrating Sanders based on the same conversation, and yet when it comes to Vought, you say “I haven’t heard that”. Either you’re watching a 10 second clip out of context, or you are applying completely different logic to Sanders and Vought for some reason. Fiona you are avoiding the question. Do you believe Jesus is the only way to heaven? Do you personally know Jesus? Loving your neighbor is wonderful, but if Jesus isn’t the Lord of your life and he’s not your savior, then your not going to heaven. No matter how friendly you are to your neighbor. Your good works are not the ticket to heaven, but giving your life over to Jesus – is and making him the Lord of your life. That’s the main point most people are trying to get across to you. Your salvation is important. No one wants anyone to go to hell, but many people are heading there because they reject Jesus. I’ve replied to this question honestly as I can where you first asked it below and I never avoid questions unless there is no hope of rational discourse. Ever. My friends tell me I should avoid more questions, especially online like this. I’ve replied to every single person who has asked me anything on this page – if you care to look through – even though I am busy here and there were a LOT. So what is your answer? How do you get saved from going to hell? Do you believe Jesus is the only way to heaven or do you believe there are many ways to heaven? Do you believe a person is saved by repenting of their sins and asking Jesus to be the Lord of their life? Or do you believe a person can work their way to heaven by being good and doing good works? Do I need to scroll down to where you first asked this question and post my lengthy answer here as well, or can you just scroll down to where you originally asked the question and read it? Or read my answer in the email you got with my answer, rather than asking over and over after I’ve answered? Maybe the moderator has removed my answer because it was too convincing….lucky I took a screenshot to repost, but if so, then you have it in an email anyway. Great. So, would appreciate if you could respond to the questions I posed to you, too, rather than respond with new topics without answering those questions. It’s hard to have any sort of sensible discussion if that’s not a given. True, Christianity is not exclusive. Anyone can come to Christ. But, Christianity is the truth of the world, and we have all stood condemned until we come to Christ. He IS the way, the truth & the life. And no one can come to the Father except through Him. So in that sense Christianity is exclusive. Christ is the only way to God. My understanding is that the story of the good Samaritan was a parable. But, to answer your question, a Samaritan most certainly could have been a Christian. And, if a Samaritan is a Christian, of course he or she will go to Heaven. There was the encounter Jesus had with the Samaritan woman at the well. She was living in sin, and definitely not saved. But, became saved as a result of her encounter with Christ, leading other Samaritans to Christ. Anyone can come to Christ. But, to be saved, one has to come to Christ. The Samaritans were not Christian – they were, according to the Bible, descended from a man named Ephraim, son of Joseph, whose descendants formed two of the tribes of Israel. They came from the area now referred to as the west bank – Samaria. They are also referred to as coming from a town named Kutha – which is in what is now known as Iraq. Their religion is Judaic, and only slightly different from modern Jewish faith – they disagree on where the centre for worship is. And I said the GOOD Samaritan, which is not the Samaritan you refer to. I referred to both the good Samaritan and the woman at the well. And, while the Samaritans as a whole group were not Christian, some Samaritans became Christians. Anyone at all can choose to follow Christ. Anyone. True – some did convert – but 600 years later, as I said. The Good Samaritan Jesus Christ referred to was not a Christian, and did not convert. Jesus told his story to show that Christians can be bad, and non Christians who are good have his favour. I believe that Samaritan would have had a place in heaven. As far as who was and wasn’t saved prior to Christ’s coming, I leave that up to God. I’m not sure what you are straining to prove regarding the parable of the good Samaritan. But, the bottom line is that no one can be saved without coming to Christ. Christ Himself said this. See, & there is an important distinction between your interpretation of Jesus and mine….For God so LOVED….You believe people need to seek what they do not know or do not believe. I believe Christ will go to those who do not go to him. BIG DIFFERENCE in the way you and I see Jesus. In the bible, Matthew 21:28-32 “What do you think? A man had two sons. And HE WENT TO the first….the Father approaches the son… You either do or don’t think God and Jesus love and want everyone to be okay and will actively reveal themselves…again….I acknowledge you couldn’t care less about my opinion, but you might want to consider the opinion of someone you DO care about thinks…Something you might want to spend a little time on….what do you ultimately believe God’s wish is, to love or to condemn? He also said, “Anything you have done to the least of these, my brothers and sisters, you have done to me.” How do you explain that? So did the institution who fired the woman who expressed solidarity with Muslims do so to help her or Muslims come to Christ? If so, I think they picked an odd way of doing so. Your logic is faulty and you contradict yourself here. Jesus being the only way to God does NOT make God exclusive to Christians. First you acknowledge it, then you retract it. Pick a side, but I warn you…while it might not matter to me how you respond to this…you might want to think long and hard about who you will ultimately have to answer to before you post. Something to keep in mind is that people with malice in their hearts covet the notion of exclusivity. Sadly we can’t even really discuss Christianity clearly because so many people are in fact frauds and Counter-Christ when it comes to policy/practice…meaning, there is more than one way to interpret your sentence “So in that sense Christianity is exclusive.” Operative word: “Christianity.” Saying Christ is the only way to God (meaning Christ makes the judgment call) is not the same as saying that Christianity is exclusive. Christianity means different things to different people. To me it means following the golden rule (see my other response with the quotes that support actions over words), which Senator Sanders does so with great passion in a very inspiring way). To people who try to use religion to manipulate, harm, and tear people apart, Christianity is a label used as a tool to help them achieve that goal. YES!! This hits the nail on the head. I WILL say that if Fiona doesn’t. “And the King will say, “I tell you the truth, when you did it to one of the least of these, my brothers and sisters, you did it to me.” I think Mr. Vought will have something to answer for at that time. I think the woman who got fired was less, by almost any criteria, than the institution that fired her. Mr. Vought defended the wealthy in this instance, which Jesus rarely if ever did. A lady back in the conversation a way said we weren’t supposed to take the parable of the Good Samaritan as applicable to present day Christians. Why not? The Bible contradicts itself, but in my humble opinion, the parable is more in tune with most of what the Jesus of the Gospels said than what he supposedly said in John. You are of course allowed to disagree. Sanders only looked like a credible candidate when his opposition was the career criminal named Hillary Clinton. It is really a testament to the condition of our political system. Both parties are dominated by individuals who are not governed by any principles, much less biblical principles. Sanders fought for equal rights of black people, women, and other oppressed groups all his life. His principals are on record as being very close to the founding fathers in this regard. Yes, the old can’t judge because we all have sin stone that gets thrown when there is no argument. Yet, you feel very superior to this site to post “Throughly hipocrtical”. *hypocritical. And if that is addressed to me, I criticized the article, not ‘this site’. It’s stated in the policies of this site that that’s perfectly OK, so long as I am respectful and *see all people as equal regardless of their belief*, to disagree with the article and other posters. You can go ahead and check the site policy – I am acting within it, and according to my Christian faith which calls on me to be honest here. So because you do not know why your posts have been removed you then are free to say “I’ve stepped in something that stinks with whoever is moderating/removing my posts here. I feel it’s probably just plain old racism, lets be honest about it.”? Yet your not judging? Your not the pot calling the kettle black? Of course I am judging! How can anyone converse about these topics without using judgement? But I am not condemning, I asked several times why my posts were removed and got no answer. I said I was afraid there were racist motivations because all I had written was that we were all equal in the eyes of the lord and we should love of neighbours – also sinners – according to Jesus Christ and quoted scripture to explain where i’m getting that from. I STILL didn’t get an answer. So…I will change my mind if the moderator explains why they removed those posts. I hope I am wrong because racism, judging others, and being hateful towards Muslims is all unchristian, and *should* have no place on a christian website. You judged someone as a rascist without knowing ANYTHING about them. The ONLY thing you know is that a post of yours got deleted… that’s ALL you know and you can then judge someone as racist? You condemn yourself by your own words. I asked why they had been deleted, and said that I was afraid the motivations were racist as there was literally nothing against policy in my posts. That is not calling someone a racist, that is asking a question and telling that person that given the lack of any explanation, I am afraid their motivations may be racist! After all, Vought very clearly expressed a very bigoted opinion which is unchristian in what he wrote about that kind christian lady, and his reasons for firing her were unconstitutional. I will be *very happy* to hear otherwise, but there is no response. I did not slander anyone, I asked why my posts quoting scripture were removed, I said I was *afraid* there were anti-muslim, racists attitudes for removing them and asked for clarification which I did not get. The moderator was online, and deleting posts when I asked that, twice, and they chose not to respond at all. Now you are just repeating the same thing, despite my response, and name calling, over and over, even though it’s already been clarified as best I can. It’s *hypocrite, by the way. Lets go back to what you posted again… You wrote “I feel it’s probably just plain old racism, lets be honest about it.”. Ending this part with the sentence “lets be honest about it” moves your claim from just a feeling to an objective statement. Your claiming that there is obvious truth in the statement that the deleting of your post(s) is just plain old racism. AGAIN, you know NOTHING about WHY your post was deleted. You have NO knowledge. NONE!. ZILTCH! NADA! That alone constitutes slander. You don’t even know IF an actual person was involved in the deleting of your post. You have made a claim of racism with no evidence, no knowledge. The fact that a post was deleted in not evidence of anything OTHER than your post was deleted. That fact that you have gotten no explanation is evidence that you still know NOTHING. NADA! ZILTCH! Your a bigot because you stand in contempt of a world religion that has stood the test of time and you are totally intolerant. You are a hypocrite because you apply a double standard to yourself as opposed to other on this site and The Stream. Where I come from, the expression “lets be honest about it” is often placed right after an “I feel” or “I’m afraid” statement. It means – something like – I’m slightly uncomfortable revealing this personal thing/fear, but I’m going to. That might be an Irish thing. It is in no way representative of any objective fact, and I would never have even imagined it could be interpreted that way. That may just be because I’m so used to the phrase in my own cultural context. That post was the last one after several far less frustrated ones in the previous hours. It was frustrating because I was engaged in a conversation with one other poster, Howard Rosenbaum, and our conversation was getting minced and things I thought long and hard about and wrote to him just getting removed before he even had a chance to respond. I’ve already posted here that I probably could have phrased it better, but it’s a very frustrating thing to happen when you are thinking hard about difficult topics. I apologise unreservedly for any offence interpreted – it was not intended – but that’s fear for you. I was afraid that I might be dealing with Christians who felt that being kind to Muslims was a fireable offence, as Vought did, and that hence my posts quoting the bible and Jesus Christ saying such attitudes were unchristian were removed. I read the policy again. Twice. I went through my posts again, several times, mentally, to try to figure out some other explanation. I voiced my concerns to the person I was in mid conversation with, who also said he saw no reason to remove my posts. I was relieved. We had not agreed with each other but had been respectful, and I was glad to know that he had not taken offence or reported me for something. I have written several times that I was afraid, but did not know, if the motivations for removing my posts were anti-Muslim racist ones. I explicitly asked the moderator active at that time to explain what I had done wrong. They STILL have not replied. I DID NOT call anyone a racist. These subtle differences of language are extremely important – otherwise, people could take offence all day long at misread things. Everything you need to verify what I say here is on the page, and yet…. I am a Christian, so no idea what you mean about me being a bigot for hating whatever religion I don’t hate – but pretty ironic that you say that considering your comment to me right before it! hahaha – that’s actually – is it funny? I dunno – it’s pretty clear hypocrisy – that’s for sure. I am a Christian who thinks we should love our brothers as sisters, sinners or not, as per the teachings of Jesus Christ. I really am Fiona. I am not a troll. Trolls don’t post like this – they post rather more like your post above. If you still don’t believe I am Fiona, send me an email address and I’ll send you my public university webpage address where you can see who I am, and a photo of the same me holding a piece of paper that says “hello GPS daddy, this is Fiona the Christian, I am not a bigot. I really will do that, no problem. I wrote a response to this but it has been removed too! GPS Daddy, are you the moderator? I offered proof that I am Fiona and not a troll, and a lengthy and considered response to what you say above…including an explanation of the phrase “lets be honest about it” as something that is commonly put after any “I feel” or “I’m afraid that…” statement where I come from, to mean “I’m slightly uncomfortable stating this fear or feeling but I’m going to do so anyway”. I explained it as potentially an Irish thing, and apologised for any misunderstanding….and a lot more besides….but the moderator has removed it. Bizarre. Or maybe you deleted it to claim victimhood. If I were the moderator you would see a “MOD” next to my ID. Hahaha – I guess that’s theoretically possible, but why would I write a very long post I just want to delete? Also, see posts from someone who doesn’t actually agree with me but also noted that my comments were being deleted as he responded to them yesterday, and also saw no reason for them being deleted. I think if I had done it, you would see it marked with ‘this comment has been deleted’, because I saw that when I replied to the wrong person, then copied and pasted it to the right person once I realised. But if a moderator does it, it just vanishes without trace as my posts have done. Thanks for the tip re MOD – I’ll go looking for whoever moderates here now, and see if they are honest enough to tell me why they removed my posts. Did it, and now there is a ‘this comment was deleted.’ message below. Wow all that deleted too? Hey moderator, why can’t you at least explain why you’re deleted my posts? They are completely within the policy of the site…as far as I can read in the policy tab….come on…you’re just making me more and more determined to keep posting what I’m saying, and making your moderation activities look questionable. If you had stopped at “I feel it’s probably just plain old racism” then you would not be guilty of slander. You expressing a feeling. But you did not. You added “lets be honest about it”. —used to say that something is true and cannot be denied Let’s be honest, those two were never right for each other. Adding that little phrase changes your statement from a feeling to a claim of truth. With “lets be honest about it” added in you are now saying that your posts being deleted is clearly racism and that cannot be denied. You are making a false statement against the moderator that is damaging to them. That is slander plain and simple. Now on to bigotry… Using the word in the same way you use it here this makes you a bigot… you are intolerant of other’s people positions so much so you call them bigot and racists. So you exemplify bigotry in your posts. This also makes you a hypocrite. For you do exactly what you accuse The Stream of doing. Sounds like Vought definitely slandered all Muslims then. Why do you think my fears that there was biased moderation were false? The moderator was asked for any other explanation, and explicitly told I would give him/her the benefit of the doubt, and would like to be convinced that my fears had no basis if any other reason for removing my post exist. it’s usual to explain why someone’s posts were removed if they are removed, especially if asked to do so directly, none was forthcoming. If that is your argument then you are not a Christian. You do not understand the Bible. I have shown you your error. You have not acknowledged it. You have not even said your sorry for it. This is another data point that you are not a Christian but rather someone coming to this site to post inflammatory comments to upset people. Note: I have had comments deleted from this site. Comments that I thought fit the criteria. No explanation was given even when I asked. I’m not the one you have to apologize too. I’m not the moderator. I’m not the one you accused of racism. I’m calling you on the carpet for throwing the race card around. So you need to apologize to the moderator. In this case it Dr. Michael Brown. if you have spent time at The Stream you would see some authors of articles interacting with the comments… when they do they have a “mod” symbol next to their comment showing they are the moderator. I do not have such a symbol next to mine. However, since I do not know the inner workings of The Stream I cannot say for sure who the moderator is. Never the less. You need to apologize for accusing not for making someone feel bad. I’m bored. You say something, I respond, you then say something unrelated without acknowledging that I’ve just asked you things. Every time I respond to your angry rants and accusations with evidence, or explanation, even above where you come on all aggressive to tell me it was a MUSLIM who was fired, as though that makes any difference, and that I’m therefore a LIAR for saying she was Christian, and you quote her saying she’s a Christian – having totally failed to see that she says “me, a Christian” in the quote you write, completely obliterating your own argument ?!?!!! It would be hilarious if it wasn’t so….yuck. Instead of saying ‘ok – I was wrong about that’, you ignore the fact that your own aggressive argument has been obliterated, BY YOURSELF!!! hahahah!!! and come up with some new dirt to hurl at me. This is not the kind of discussion I’m interested in having. I don’t think it’s a discussion at all. You are angry, you’re not being reasonable and your arguments are circular, aggressive, and really disorganised. Organise your thoughts or expect zero further response. Can. Muslim go to heaven without accepting the Jesus is God in the flesh? Can a Muslim go to heaven claiming that Jesus was just a man? Apparently you didn’t read ANYTHING Fiona wrote. That means you’re judging her only on the basis of her disagreeing with you. If you can’t read and comprehend what she said, you shouldn’t accuse her of things. I focused on one part of what Fiona wrote. Only the part where she accused the moderator of racism due to comments being deleted. I addressed nothing else. The bottom line is that Sanders applied a religious test. This is explicitly unconstitutional. Additionally, Sanders was being disingenuous. He is an intelligent man. He clearly knows what scripture says, and what Christianity looks like. He most surely knows the words of Christ. Particularly the most famous ones, as mentioned by other posters here. Mr. Sanders’ “shock” was a put on. No, he did not! He applied a constitutional test because Vought had written in support offiring a Christian teacher for practising her beliefs – i.e. writing a supportive and loving message to her Muslim brothers and sisters on facebook, and against hate. Vought actually did what you are accusing Sanders of! It’s all on public record – and contained in my others posts what Vought wrote, and it was totally unchristian of him. So, do people here think it’s OK for Vought to fire a christian teacher for writing a supportive and loving message to her Muslim brothers and sisters on facebook? Because the Pope did the same thing….is he unchristian to in your opinion? Firing an employee is not the same thing as applying a religious test for holding office. I’m curious, Fiona, what do you believe qualifies as a religious test, according to the constitution? Please read above for my response to that. Sanders applied a constitutional test, not a religious one. Vought fired an employee, a Christian woman, for posting a message of love and solidarity with her Muslim brothers and sisters on facebook. Do you agree with Vought on that? Would you support firing that woman for posting such a message? I don’t know the details of that case. I may check it out at some point. However, it is irrelevant to Sanders applying a religious test as a prerequisite for holding office. I do have to say, though, that Mr. Vought’s demeanour and calm, reasonable and rational responses to Mr. Sanders leads me to suspect that he had good reasons for firing the employee. He didn’t apply a religious test. 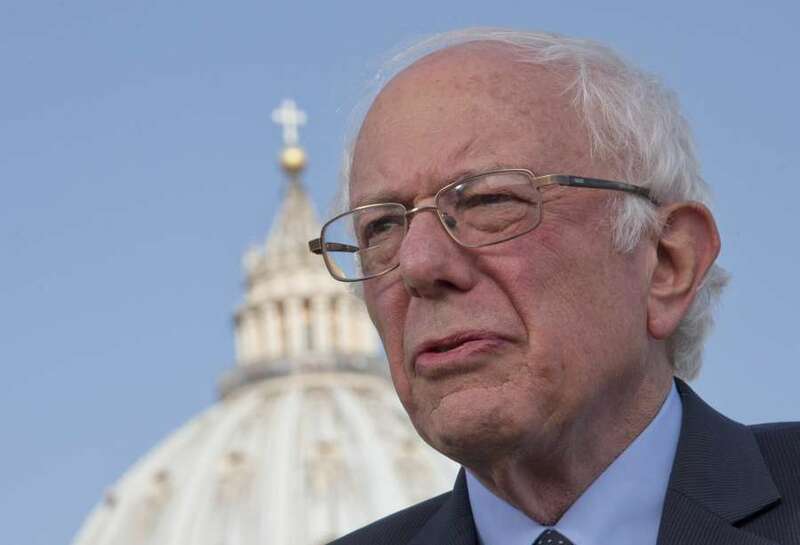 He works successfully with Christians all the time, and got on well with the Pope, so the suggestion that Sanders is anti-Christian is demonstrably false. Sanders never talks about his personal beliefs, he talks about political issues and his political values seem similar to Jesus Christ in that he believes all people are inherently equal. He applied a constitutional test because it’s illegal to fire someone for practising their faith, which is what Vought did. It is the central issue Sanders took with Vought – not irrelevant at all! Vought fired a Christian for practising her faith by posting a message of love to Muslim brothers and sisters on facebook. It’s all in the public domain. He wrote that Muslims are ‘condemned’, so I agree completely with the logic of the poster above, and of Sanders – if Vought feels that people who don’t share his exact beliefs are ‘condemned’, and thinks it’s OK to fire people for practising their faith, then he cannot fulfill his role without breaking the constitution. You haven’t given a clear example of what you consider a religious test. I’m talking about for holding public office. Mr. Sanders stated, rather boldly, that people of a specific faith should not be permitted to hold office. That’s a religious test, if I’ve ever heard one. It wasn’t a religious test. It was a test of discrimination of an individual with a KNOWN history of committing it. Sanders has no issue supporting Christians who do not DISCRIMINATE. Sanders ask him about what he believes. And, based on Vought’s response declared him not eligible for office. Religious test. So you’re saying that your job would have a right to fire you for being sympathetic or compassionate to any minority your boss didn’t happen to like? Would it still be okay if it weren’t based on Christian doctrine, or would it be a bigoted act either way? I think the latter. What are the details? Did she indicate in her post on Facebook that she believed something different than she had professed as part of her job? Kind of like singing the praises of Coke when working for Pepsi? I have no idea? What are the details? I’m not certain of all the details, but here’s how I understand it: a woman was fired from Wheaton College because she expressed solidarity with Muslims. Personally, I think that was a very Christian thing to do, to stand up for people who are being discriminated against. Mr. Vought disagreed because, he said, Muslims don’t accept Jesus as the Messiah, and therefore their theology is flawed. Actually, Muslims accept Jesus as a prophet, though not as the Messiah. Christians, by contrast, don’t accept Muhammed as a prophet at all. And if you worked for Pepsi, do you really think it would affect the company if you sang the praises of Coke? I don’t think the company would fail because of that, any more than Christianity will fail if Christians support Muslims as a people being unjustly discriminated against. Jesus did say, what you do to the least of these my brothers and sisters, you do to me. HE wasn’t imposing a religious test with those words. Incorrect. Mr. Vought applied a religious test to the woman who expressed solidarity with Muslims. She wasn’t working for the government, but does that make it okay? I don’t think so. Indeed. For a Non-Christian, he is a shining example of all that Jesus stood for and preached about that many Christians could learn from. Senator Sanders has certainly spoken to my heart, as has the Pope, to truly try harder to follow the Golden Rule. It’s very ironic to see “Christians” criticize Senator Sanders when his actual Political Policies are so very closely aligned with everything Jesus asked of us. The greedy who do not truly believe in being their brothers keeper and protecting the most vulnerable have exposed themselves as the Christian in Name Only types in the way they criticize the Senator, e.g. Commie comments…um, who was the greatest bleeding heart “commie” of them all? Jesus Christ. People obviously just throw the label Christian around, for what reason I’m unsure, but if you’ve actually read the bible, you know that Christ was a bleeding heart giver, helper, servant…yet many have hijacked Christianity and given it a bad name and even gone to the extent to bear false witness against Jesus behaving as if he was a heartless and greedy individual. The fact of the matter is that those type’s of “Christians” actually behave more like the Romans…when Sanders makes humanitarian remarks and fights for humanitarian causes, one’s reaction to these Christ like policies Sanders champions is a real testimony to whether the person really is a Christian or is just faking it for personal gain in a society where Christianity is the religion practiced by the majority. Again, Sanders, a Jewish man like Jesus, is one of the best representations of what it TRULY means to be Christian. As for the author making the statement “That means that you, too, stand condemned before God, no matter how much good you have done” that’s a disgusting comment (very much like an Isis Muslim extremist would say) and FAR worse….to make assumptions and portray God as hateful and petty….well, he’ll see how that works out for him in the end…even the Pope comprehends that acts of kindness from an atheist carry greater weight than false Christianity. Those who choose to condemn those who practice acts of kindness and compassion are in fact condemning Christ-like people. Wow…talk about being a living contradiction and selectively believing what you want… and that wanting leading you to chose to believe the worst vs. the best in Christ. WOW!!! He did not attack Vought’s Christianity or say that Christians shouldn’t be in government. He has worked with Christians throughout his career. That is just not true at all. He questioned Voughts ability to serve in accordance with the constitution because Vought supported firing a Christian woman for writing a kind message to Muslims on facebook. Sanders is defending the right of that Christian woman to follow the teachings of Jesus Christ. Really – it’s all there on record to see!?!! It’s wonderful that Sanders is for those things, but his attack on Vought is on the major core Christian belief that Jesus is the only way to Heaven. Anyone who doesn’t believe in Jesus is condemned and going to hell. It’s a sad reality, but that’s why Christians try to warn people and share Jesus with them. For Sanders to tell Vought believing that is wrong is the same as telling someone to stop being a Christian. It’s an attack on all Christians, because we don’t believe that there are many ways to heaven. Plain and simple. I’m wondering if we are watching the same video clip and reading the same transcript of the conversation between Sanders and Mr. Vought??? I looked at several websites both Christian and secular and see the same clip. In the clip and transcripts I do not hear the conversation about Mr. Vought firing anyone. In the clip that is being circulated around it appears to be a direct attack on Mr. Vought for his Christian beliefs. Which when you think about it, it doesn’t make sense. Could it be that this whole thing is being taken out of context? It’s possible. Do you know where I can find where Sanders ask him about firing this person? I’ve done a google search and haven’t found it yet, but currently am looking. I’ll say something I said earlier in this conversation: missionaries have never been able to reach every corner of the world, so how could God be so unmerciful and unjust as to condemn people who never heard of Jesus but nevertheless lived righteous lives to hell? To me it’s incomprehensible that I should have more merciful ideas than God does. I can’t force him to be, but as a public servant I’d like him to feel merciful towards people with whom he happens to disagree. There’s a difference between holding a belief privately and wanting to force that belief on others via legislation. ANYONE who wants to put Christian, or any other religious belief regarding e.g. abortion into law wants to force their beliefs on others who do not agree with their morals. THAT, and not Sanders, would be explicitly against the wishes of the founding fathers. Jeez…I grew up Christian but I wouldn’t want some crack pot who thinks contraception is wrong and divorce should be illegal in government. Am I a Christian anti-Christian? LOVE Sanders! a really good man who doesn’t pontificate as this article does. This article is pure hypocrisy. Seems to me it’s Sanders who you so ardently support that is the one forcing his beliefs upon others …. How? Which beliefs is he forcing on e.g. you? or me? Lets talk concretely. The fact that Vought agreed with firing that christian for her message of love to her fellow man is the issue Sander’s took issue with, as would the founding fathers. Where is the lengthy and totally polite reply I wrote here an hour ago? There was nothing offensive in it, and we were in the middle of a discussion!!! What is this site? Is it gone because I said all people are created equal and Muslims are our brothers and sisters? If so, the Pope would also be removed from this ‘Christian’ website. Disgraceful!!! If Mr. Vought sincerely believes that Jews and Muslims “stand condemned” for not believing in Jesus as the Messiah, I question that such a belief makes anyone fit for service in our nation, which is pluralistic, no matter what else it may be. Of course you have the right to believe the text in John about no man coming to God except through Jesus. Does that mean you also believe in the passage in the Psalms about being happy when dashing infants heads against stones? I think God is more merciful than John depicts him. You are welcome to disagree, of course. the fact that you bring up the two kinds of cloth thing and the stoning thing shows that you are either ignorant or disingenuous. Which is it. You clearly do not understand the fact that there is a new covenant that replaced the old, or you are intentionally trying to deceive. you do realise that there are many versions of the Bible, and both those examples are in several of them? I am not ignorant or disengenuous. When I studied the Bible with the Jesuits we looked closely at such passages, and at their equivalent in the Koran, and the songs of solomon, all to consider the question of interpretation. In greek and english and hebrew. The Pope would agree – he called Muslims ‘brothers’. This article totally fails to take into account that Vought is a a self-proclaimed, textbook bigot. The author is engaging in hypocrisy, and trying to pass it off as a higher morality. Ugh. A reply to Fiona’s reply to an earlier reply I made. ( Disqus seems to be uncooperative ) Not so. First you don’t have to agree w/me regarding Christian doctrine. I am not the last word. Yeshua , however is. I will spare you the bible lesson. Even a casual search of The Master’s words as recorded in scripture will confirm Mr Vought’s biblical views. No disrespect to the pope, but he also isn’t the last word & many committed Catholics as well as the teaching of their church confirm that. Yes, by virtue of our biology , all men are related. We all have a common genealogy. We also all have another common denominator which unites us . The stain of sin. Perhaps you may reject that notion, but to do so would exhibit a blatant misunderstanding of scripture. The “brotherhood” of man ideology is not a biblical one. Jesus Himself a Jew, accused certain Jews of being of their “father the devil”. Look it up for yourself. Did that make Jesus , a Jew a child of the devil ?! So no, only one whose lineage can be traced through the redemptive blood shed for all mankind brings one into God’s family & makes us brothers & sisters. You can refute that, but not by the bible. Hey, the Pope refutes that, Catholicism refutes that, but I suppose you’ll find people who believe everything on this planet. Some people even believe the earth is flat. The Bible literally said brothers and sisters, and please don’t spare me any Bible lessons – go right ahead, otherwise what’s the point of this comment section? I studied the Bible for several years under the jesuits, where I read English, Greek and Judaic versions. I also studied the Quran with the Jesuits – because it’s essentially the same ancient text as the Old Testament with very few differences. She studied under the Jesuits, ladies and gentlemen. No wonder she appears not to know the first thing about Christianity. OK – what you said about me and about Jesuit clergy clearly breaks policy of this site. If your comment isn’t removed – this site is not sticking to it’s own policy. The Pope would agree – he called Muslims ‘brothers’, which is consistent with Jesus Christ teaching that we are all equal in the eyes of God. Love thy neighbour. All that good, christian stuff, or not? Wasn’t Hawkins being a good Christian by showing love to her fellow man in times of hardship? Fiona, you have repeatedly lied about what Vought did, about what the muslim professor did, etc. Let’s turn the question around. If Muslims and Jews “stand condemned”, does that not mean that Mr. Vought and anyone who agrees with him is free to discriminate against anyone he deems “condemned:? If so, can he be trusted to fulfill his duties in an unbiased way? Exactly! They are accusing Sanders of what Vought was *actually* doing – firing people for practising their faith. That woman was practising her Christian faith when she wrote in solidarity with Muslims against racists on facebook, and Vought supported firing her for it! You need to watch the video of Mr. Vought answering Sanders question. He addresses that and quotes the Bible as loving your neighbor as yourself. What Sanders did was attack the core Christian belief that Jesus is the only way to heaven. Anyone who doesn’t believe in Jesus is condemned and going to hell. That’s why Christians send missionaries throughout the world and try to share Jesus with them. We don’t want people to go to hell, so we warn them because we love them. To say it’s wrong to believe this is the same as telling someone to stop being a Christian. It’s also an attack on all Christians, because we stand by this core belief. We don’t believe in many ways to heaven. It is not a core Christian belief to judge others as condemned. It is unconstitutional to fire people for posting kind statements on facebook in accordance with the teachings of Jesus Christ, as Vought did. It is unchristian. It is very Christian to have compassion and love for your fellow man, whether they are sinners or not. No – I think there are many routes – so long as people act towards others in a way that Jesus taught – such as, loving their neighbour, seeing all as equal in the eyes of the Lord, not judging people because that’s the Lord’s job….I believe the good samaritan went to heaven, and he was not Christian. I believe that’s why Jesus taught us about him – to prevent people becoming fractured and feeling superior to each other. To abandon tribal instincts in favour of universal love for fellow man. Even sinners. Even Samaritans. Even Muslims. Even when it’s really not easy. For this reason, I also believe in separation of Church and State. So did the founding fathers, so does the Pope, for similar Christian reasons. You’re cherry picking. He says all the things I mention above, which are the opposite of Vought. The entire Bible disagrees with you. With respect, you are missing the big picture and Jesus whole reason for existence: we are hopelessly separated from our creator. Through HIS life, death and resurrection, HE became the way to heaven. He Himself said He is. Those who embrace their helpless dependence on God for salvation and come to Him are changed and their lives will show the fruit, which are the “routes” you mention. If any possible “route” was humanly possible there would be no need for Christ. All of which is off topic as, again with respect, you are “cherry picking”aspects of the Wheaton college incident to play on emotions, as is Mr. Sanders, to try to disqualify Mr. Vought based on his personal religious beliefs. Two things are salient re those beliefs: In no way are they relevant to Vought’s potential position…and, objectively , Mr. Sanders hasn’t a constitutional leg to stand on with this line of attack against them. With respect? You just give a lot of your opinion with zero biblical references or legal references or any other back up, as though it is fact. It’s arrogant. Why should we believe you know the constitution better than the ACLU and official constitutional lawyers? Why is your personal interpretation and cherry picking better and more valid than, say, the Pope’s? Why do you just list a lot of opinions without even responding to the points I raised or the evidence I cited? How can you convince yourself that doing so has anything to do with ‘respect’? With “respect” means I respect you as I answer you. I cited first the truth with specific reference in John which clearly contradicts your points above, which you blew off. I cited the Bible, the entire bible, that you as a Christian, I assumed, would know and respect as authoritative regarding the truth which you claim to know. You ignored what I said and didn’t respond to my points and instead are attacking me as arrogant. I didn’t make this up-it’s clearly in scripture. If you will not accept Biblical authority, then it is no wonder you will not accept constitutional authority in the Sanders/Vought issue, which is what this whole thing originally was about. I am sorry you will not. . Peace. Now – to me that looks like blatant twisting. Several US legal authorities have stated that Sanders did not break the constitution, and released statements against Vought based on the constitution. Why do you ignore that, and instead pretend the exact opposite is an established fact? Do you represent an official authority on constitutional law that is superior to the ACLU or government lawyers? You say you cite the Bible, as in the whole book, can’t you pull out a quote from scripture rather than just state your opinion as fact? What do you think of Jesus’ telling us not to judge, to love one another, and that all are created equal? Do you really think I’m lying about that? At the risk of boring the heads off anyone reading the repition in my posts, would you like me to again quote those passages of scripture? He is not cherry picking. He is stating standard Christian dogma. You are cherry picking and twisting. Where did Jesus ever say anything that contradicts or negates the quote =? You will find the answer to your question already posted over and over in answer to the same question on this page. All are equal in the eyes of the Lord. Let he who is without sin cast the first stone etc. Fiona…. most professing Christians believe what the Bible says about salvation and believe Jesus is the only way to heaven. Everyone else who doesn’t believe in Jesus is going to hell. Because we believe Jesus is the only way to heaven, should all Christians be banned from holding public office? Muslims believe something similar and believe non-muslims are going to hell. Because Muslims believe Islam is the only way to heaven — should all Muslims be banned from holding public office? Other religions believe their way is the only way to heaven. Should they also be banned from holding public office? Only Universalists believe in many ways to heaven. Then there are Atheists who don’t believe heaven exists. I am a Christian, in an overwhelmingly Christian state. Nobody here believes that all non-Christians are condemned, not the priests, not the Pope. He said so publicly. Do you believe and read the Bible? Where in the Bible does it say what your saying? Are you questioning my beliefs, Dena? That would be unbelievably hypocritical, given your stance on Sanders. I quoted the Bible many times, in American Standard and International versions, in lengthy posts that seem to have been removed by the moderator for reasons unknown and unexplained. If you don’t know where in the Bible it says that all are equal in the eyes of the Lord, or where it says that he is without sin should cast the first stone, or where it says to LOVE your neighbour as yourself, or the parable of the good samaritan (a non-christian) then you should read the Bible. These are basic golden rules of Christianity. If you know the Bible, then you know these basic tenets of Jesus Christ’s teaching. There are many references to these basic tenets, take your pick. Anyone is free to question anyone else’s beliefs in the US. To do so does not mean you are hypocritical. If Bernie Sanders wanted to sit privately with Vought and question his beliefs, that would be perfectly fine. The problem is that Sanders suggests that anyone who believes in traditional Christian doctrines should be excluded from government SiMPLY BECAUSE THEY HOLD THOSE BELIEFS, not because they propose to impose them via their government job. By the same token, Muslims hold the belief that only Muslims will go to heaven, therefore Sanders should also argue that Muslims are unfit for office. I would encourage you to read the Book of John and then the Bible in its entirety. Read what Jesus says about salvation in context. Your salvation and where you are going to end up for eternity is important. You do not want to get that wrong. But Muslims believe that all non Muslims are condemned. Do you think they should be excluded from office? Actually you’ll find that the majority of Christians do not believe the way you do. Most Christians believe what the Bible says about salvation and what Jesus says. It does not matter what your friends believe, what any leader believes. Their opinions will not save you! Your salvation is important. You don’t want to get that wrong. Read for yourself what Jesus says in the Bible about salvation. Read the book of John and the 4 gospels in their entirety and then the whole Bible. Do this so you know nothing is taken out of context. You know the least about our country of any person I have encountered. Fiona: The good Samaritan was not a real person. “He” was a character in a story Jesus told to illustrate a point. And even if he were real, his good works would not save him. Only faith in Christ can do that (Ephesians 2:8-10). Therefore, God is really NOT merciful? Is Christianity essentially belief or experience? Your response does not follow, Fishcicle. Please clarify. And Christianity is both belief and experience, just as it is both faith in a person and a relationship with him–can’t drive a wedge between them. I recall a story about a Zen Buddhist teacher in Japan who was illiterate. One of his students read him the Beatitudes, and after he’d thought about it for awhile, asked him what he thought about it. The teacher replied, “I don’t know who said this, but this is what I’ve been trying to teach you.” How did this man, who had never heard of Jesus, know to teach what Jesus said? And would it not be unjust for him to be condemned to hell just because he’d never heard of Jesus? Considering the character of God, I have complete confidence that, as Abraham said, the Judge of all the earth will do right. God alone knows the heart and his judgments are perfect and righteous altogether. But salvation does not consist in following ethical precepts. The entire point of the Sermon on the Mount, of which the Beatitudes are the opening salvo, is to show how humans have underestimated or accommodated God’s holiness to their sinfulness and are completely incompetent to obey God’s law, to show them their desperateness in sin and to drive them to the Savior. You obviously know nothing about Jesus, or Christianity or what it teaches. Furthermore you have demonstrated that you don’t even know what happened here. Vought did not fire anyone. Then I guess I’m condemned to hell because I don’t believe that God is less willing to be merciful than I am. Missionaries have never been able to reach everyone. If God doesn’t allow salvation to people who never heard of Jesus but live righteous lives anyway, what kind of God is he? The reflection of people lacking in mercy, in my opinion. Thats why we have the urgency to try to reach everyone in the world even in the most remote places. We don’t want anyone to go to hell, but if you don’t repent of your sins and make Jesus the Lord of your life – you are going to hell. You can’t change what the Bible says. Being a good person alone isn’t enough to get to heaven. The thing is no one is perfect. Only God is perfect. Even one sin is enough to send a person to hell. That’s why Jesus sacrificed himself for our sins, so we can ask for forgiveness and make it to heaven. Since we don’t have the original manuscripts of the Gospels, but DO have manuscripts with errors in them, I’d say it’s very possible to change the Bible. Let me ask you if the essence of Christianity is belief or experience. Have you heard of the Dead Sea Scrolls? The Dead Sea Scrolls were copies of the Old Testament from 250-150 BC. They were such an amazing discovery, because they prove the reliability of Old Testament manuscript. There were minimal differences from the Bible today. So every Muslim is a bigot, then. Because they believe the only way to heaven is to become a Muslim. I work with and know many Muslims who believe that Jews and Christians are their brothers and sisters, and who do not believe the only way to heaven is to become a Muslim. Extremist on both sides believe strange things, it’s not sensible to imagine all Muslims are the same, no more than it is sensible to imagine all Christians are members of the Ku Klux Clan. When Senator Bernie Sanders took his oath of office as Senator, he swore to uphold and defend the US Constitution including the Bill of Rights. Bernie Sanders violated his oath of office. If Bernie no longer supports our Bill of Rights, he should be impeached or recalled. He is no longer qualified to serve as Senator ! He also owes Christians an apology ! No Sanders did not violate the US Constitution. He questions Vought’s beliefs not about Christianity – not at all – but that he wrote in support of firing a Christian woman for posting a message of love to Muslim brothers and sisters on facebook. Are people just reading the one line of Sanders and nothing else in this whole conversation? Also – the job was about deciding where funds go. Is he likely to give funds to people he considers “condemned” equally to those who agree with him? That’s the central question. If that is in doubt, and I think it’s fully rational to assume there is doubt about that, then he is not fit for office. Yes…that is exactly what he believes. He’s a communist. What part of that do you not get? This guy is an American cancer. He’s a leech and has been one his whole life. You said a lot of nice things about him..which I’m sure you meant. But that doesn’t mean they are true. This gentlemen is one of the most disgusting people in public American life I have ever come across. He doesn’t have a genuine bone in his body. He’s a grifter…a life long grifter. Which part do *YOU* not get? Vought wrote in support of firing a Christian female teacher for posting a message of love towards Muslim brothers and sisters on facebook. It’s against the law and against the constitution to do that. That’s what Sanders questioned. Simple. He didn’t question his Christian faith – that’s not true! Sanders has worked successfully with Christians his whole career and got on very well with the Pope! What are you insisting he’s all these hateful things? There is literally no evidence that he is and calling other people names like that is against the teachings of the Bible. You just call him loads of bad names with no evidence here – literally none at all. “One of the most disgusting people in public Anerican life”, you say? Really? Because what about the guy who contradicts his own lies and boasts about grabbing women in the privates and such? Do you support Trump, the rich man who will find it harder to enter heaven than it is for a Camel to pass through the eye of the needle, is it? SMH. This is dangerous if this becomes something pushed by the left…. if you believe Jesus is the only way to Heaven, you’re a bigot. Everyone is a bigot, Dena. Liberals just don’t want to admit their own bigotry. I try not to be a bigot, though there are people and political beliefs with which I disagree. That is pretty much a textbook definition of the word bigotry, agreed. I believe Jesus is the only way to heaven. Jesus loves you and has a plan for your life. And Jesus spoke of the good Samaritan, who was not Christian, to teach us that Christians can be bad (the priest who walked past) and non-Christians who are good have his favour. You’ve misinterpreted the parable, Fiona. Examine it in context (Luke 10:25-37). A Jewish lawyer challenged Jesus with the question, “Teacher, what shall I do to inherit eternal life?” He was trying to get Jesus to say something that could be used as a point of condemnation. Jesus replied with the first and second great commandments and told the lawyer that if he did these impossible things he would live, teaching us that the law does not save because the standard of righteousness is too high–instead, it drives us to despair of our ability to save ourselves and to seek a savior (Galatians 3:24). But the stung lawyer, “wishing to justify himself” (that is, to make excuses), asked Jesus, “And who is my neighbor?” Jesus then told the parable of the Good Samaritan to show his hearers (a Jewish audience who hated Samaritans) that loving one’s neighbor involves selfless mercy and compassion, Christlike qualities, even to one’s enemies. Priests and Levites, by the way, would have been this lawyer’s daily companions. The parable is a story, a work of fiction Jesus used to illustrate his point. The characters were types, not actual people. And it is anachronistic to equate the Good Samaritan with God-favored unbelievers and the priest/Levite with disobedient Christians–those categories didn’t yet exist when Jesus told his parable. Right – and he told that story to tell people not to condemn people of other faith. Now, he would agree with Sanders that we should not condemn Muslims. Now some Christians are hating Muslims and Jesus would tell us to love our neighbours, and not to judge them as that is the Lord’s job. No, he manifestly did not tell the parable as instruction not to condemn people of other faiths. He told the parable to answer the lawyer’s question regarding the concept of neighbor. He could just as easily have used a Roman soldier character instead of a Samaritan–the point was to illustrate the kind of heart of which God approves, the one that has mercy and compassion upon another. I would appreciate it if you would expand on the statement “Now some Christians are hating Muslims.” Is it hate to tell them that their religious beliefs, especially concerning salvation, are misdirected? That Jesus is both savior and Lord and the only name given under heaven by which we must be saved (Acts 4:12)? The beggar who tells another beggar where to find life-giving bread is not judging the latter if she directs him to the bakery and not the woodpile, no matter how much he insists bread is to be found somewhere under all those logs. I was thinking of the Christians who go around setting refugee shelters on fire in Europe, crashing cars into peaceful protests, and beating Muslims up on the streets, who don’t get reported AT ALL in right-wing media in the USA. I call those sorts of people, and those that support them or get off on bashing ordinary Muslims “pretend-Christians”. Are you aware of the express motives of the persons who are doing all of those shameful acts? I found many reports of such incidents, but no statement that the perpetrators were acting from specifically religious reasons. You’ve never heard that e.g. Ku Klux Clan claim to be Christian, then? Because it’s no secret…Or the anti-balaka groups in Central Africa? The National Liberation Front of Tripura or the Nationalist Social Counsel of Nagaland in India? The Maronite Christian Militias in the Lebanon? The Lord’s resistence Army in Uganda? Or, sticking only to people who murdered for claimed Christian reasons within the USA – Eric Robert Rudolph who carried the Olympic Park bombing in the USA? Charles Barbee, Robert Berry and Jay Merelle? Michael F. Griffin? Paul J. Hill? Scott Roeder? Shelley Shannon? Robert Doggart? Robert Lewis Dear? Need I go on? because I can…Daryl Johnson (Department of Homeland Security) said that the Hutaree Christian militias have more weapons than all Islamic terror defendants charged in the US since the September 11 attacks…it just goes on and on. Those are types, which DID exist when Jesus lived. I think the shoe fits. By their fruits shall ye know them. The reason the story is a parable is that the types were recognizable and it was unexpected that the Samaritan should behave better than the Jewish people who passed the victim by. So you believe we should drive all muslims out of this country, because they are all bigots. Where in the world did you come up with that statement? I never said that. If what Sanders is saying gets pushed by the left, they would say any religion that believes in eternal condemnation for others of unlike faith are bigots. Problem is most faiths including Islam, Christianity, Judaism believe in eternal hell for unbelievers. That is part of all those religions and under the constitution we have freedom of religion. According to Sanders only Athiest or Universialist should work in Government. That is a religious test and against the constitution. If we want to be consistent, we should admit that we’re bigots too, as was said above, and that’s why we’re driving them out, rather than because they’ve actually done anything deserving that penalty (except for a minority of them). In all honesty, I dont think religious people ARE fit to serve. By embracing the fairy tale of religious ideology, it shows a deficit in judgement and lack of grounding in reality. It clouds ones ability to think for themselves, and gives an easy excuse for complacency. We need clear headed, realistic humanists running not just this country but the world if we are to progress as a race. Religion impedes the forward progress of humanity. It has no place in our government. If there are ANY doubts, I leave you with this – The war in Afghanistan, than Iraq, was started because Georgie “prayed” on it and felt god tell him that was the way. Religion is why I don’t kill you. You should be grateful for it. Everyone has beliefs that they think are true. We have a lot of disagreement in America because people disagree on what is true. Wow. I don’t kill people because I don’t hate people or ever get aggressive. Nothing to do with religion – more to do with personality. So you believe in a religious test for office? You don’t support the constitution? The Constitution is talking about a legal religious test. A law that the government makes about what religion a person must be to hold office. The Constitution does not prohibit individuals from using any criteria they want when deciding who to vote for, or vote against. He DIDN’T USE a religious test!!!! He objected to Vought because Vought fired a CHRISTIAN woman for putting a kind message to Muslims on her facebook page!! Why is this so difficult to understand?! Nobody has the guts to answer straight whether they think Vought was right to fire a Christian woman for putting a loving message to Muslims on her facebook page. They just keep saying there was some religious test which there clearly wasn’t! They are accusing Sanders of what *Vought* actually DID do and Sanders DID NOT DO. I can only assume this is because Sanders is not Christian and Vought is. Which is bigotry – by definition. He specifically questioned Vought about his beliefs. And, declared that his beliefs make him ineligible for office. Fiona, I keep wondering if you are that woman that was fired. You seem to be getting so upset about that. That is simply not true, and you can go look at the video and it will not be there, or go look at the transcript! This is really bizarre….why do you keep saying he said that when he clearly, for all to see, didn’t!? What makes Vought ineligible for office, and what Sanders very clearly said and referred to, is that Vought fired someone for acting on their Christian beliefs and writing a kind message to Muslims on facebook. THAT, and not his Christianity, makes him ineligible for office. It’s against the constitution. Period. I did watch the video. OK – so then you do know the case in question and you do know that Vought said that because he agreed he said and did exactly what Sanders described, for exactly the reasons Sanders described, in that same video, right? This is false. Vought wrote his statement in support of Wheaton College, but he had nothing to do with the firing. Sanders, on the other hand, actually did say his line of questioning directly related to religious pluralism in the beginning of his questioning. Based on his wording, I can’t avoid the conclusion that Bernie Sanders believes that politics should exclude anyone who is not either a pluralist or an atheist. That is not a logical conclusion – at a very basic level. The constitution demands pluralism. It’s literally written right into the law of the land. But – you are correct in saying you are concluding from Sander’s wording rather than this being something Sanders said explicitly. I bet if anyone tried to enact a law that said that religious people could not hold office, Sanders would be the first one out there protesting against it! In fact, that’s what he’s doing, when he speaks for protecting Muslims against racism. I mean, his whole complaint against Vought was that he painted all Muslims all over the world with the same brush as inherently condemned, which is directly opposed to the constitution. If he was anti-religious, why would he be demanding basic respect for Muslims? How can that be concluded? It makes zero sense. It’s irrational. You are lying again. The Constitution does not demand “pluralism”. The word never appears in the document. Pluralism: “a : a state of society in which members of diverse ethnic, racial, religious, or social groups maintain and develop their traditional culture or special interest within the confines of a common civilization b : a concept, doctrine, or policy advocating this state” (Miriam-Webster English Dictionary). Do I need to join the dots? You keep lying. Vought did not fire anyone. He defended Wheaton college’s decision to fire a professor who, while teaching at a Christian college, decided to start becoming a pro Muslim activist. Yes, which is why all over this page you’ll see me refer to Vought as writing an article in support of firing the woman….??? No! haha – I am not the woman that got fired, her name was posted above somewhere up there by me – I looked it up – and read the horrible article Vought wrote saying it was right to fire her for posting a nice message to Muslims on her private facebook page. I’ve never been fired but I bet it’s horrible! especially if it’s for writing a kind message on facebook. Sanders did not declare that Vought’s *Christian* beliefs made him ineligible for office, but *obviously* beliefs against the fundamental tenets of the constitution – such as being a fascist, for example – DO make people ineligible for office. That’s what the problem is. You seem to be arguing that ALL beliefs of a Christian are somehow sacred because they are a Christian’s beliefs – even if they are UNCHRISTIAN beliefs such as Vought’s! This makes no sense – it’s just not logical. A Christian may believe the earth is flat, that doesn’t make it ‘true’ or make it ‘wrong’ for someone who is not Christian to say that’s rubbish. It’s not Vought’s Christian beliefs that were the problem, it was his very unchristian ones, and his willingness to act in a way which is actually against the law based on those unchristian beliefs (racism/bigotry in the workplace). You keep lying about what the whole thing was about. The Muslim woman was hired to teach at a Christian college. She also added: “I have sought the advice and blessing of one of the preeminent Muslim organizations in the United States, the Council on American Islamic Relations, #CAIR, where I have a friend and Board colleague on staff.” Hawkins began wearing the hijab on December 11, and continued to do so throughout Advent. erm….you just quoted her saying she was a Christian? Am I missing something? I can’t comment on what you say Vought did because I don’t know what happened. But, I will say that Christian businesses have the right to determine who they employ. And if they have an employee who does not meet their requirements, they can end the employment. It was not a business – it was a teacher in a college. Have you not watched the video in question? A college is a business. And if it is a Christian college, they can have standards about the behavior of their employees. Employment is a business transaction and should be voluntary for all involved. Vought defended his position, pointing out repeatedly that he’s a Christian who holds fast to orthodox Christian beliefs, including the belief Jesus is the only way to salvation. Like most leftists, you simply lie about what the controversy was about. It had nothing to do with hiring or fring a Muslim woman. Bernie Sanders thinks that anyone holding conventional Christian ideas is unfit for office. Liberals won’t support Conservatives because they disagree about what is true. Sanders does not believe that what Vought believes is true. Why would you expect Sanders to do anything else? I would expect Sanders to follow the constitution. At least we now have a concrete heads up regarding his opinion of the constitution. If Sanders opposed Vought because Vought is opposed to abortion and homosexuality, would he be opposing him because of religion? Of course. Would that be a “religious test”? I think so. Would Sanders be violating the Constitution? No, he would not. Yes we do, he vehemently supports it. That’s why he objected to Vought. I’m sure he does vehemently support the constitution when it supports what he wants. Otherwise, not so much. humanists believe that everything came from nothing. enough said. Pssst…Kevin: I’m a right-wing, flat-earth believing, bible-thumpin’ evangelical Christian follower of the Lord Jesus Christ – aka the “worst of the worst,” in American pop-culture – and I also believe that “everything came from nothing”…literal nothing too! Why? Because my Bible told me so; and it’s called “Creation ex-nihilo” – i.e., everything in this “contingently existing” universe (or nature itself), derives, or owes its very existence, to that UN-created, self-existent transcendent “causal agent” which lies beyond, or outside of nature. This is the very description of nature that “Big Bang cosmology” has been consistently affirming for some 60-years now, or so; whose paradigm has fit squarely within the current “Standard Model of Physics. Why do you believe in a flat earth though? That’s not in the Bible, and even the Pope considers the idea that the Earth is flat ridiculous. I’m sort of humorously, or maybe cynically? identifying with some of the very hostile “tags,” terms, or denigrating designations with which I’ve read/heard over the last several years – used against WE mindless, dumb, dullheaded, bigoted Christians etc. – in our culture’s worldview wars, typically in the “science v. religion context. Naturally, people hate us, or excoriate us in a variety of ways, and for many reasons, so I’m just rollin’ with that mindset. God bless you so much precious sister, for reaching-out to me with such Christ-like love, compassion and concern, in trying to help me grow in reason and understanding! (I need that!) Have a very blessed day & week! I am actually a scientist. I hope that doesn’t reduce the positive effect you feel….it *should* rather increase it, if you think about it! 🙂 A blessed day and week and life to you too. Nope, I don’t believe it. Especially the Christian part. Your rhetorical style closely matches that used by the Father of Lies–asking questions to undermine the truth and lead the unwary astray. The LORD rebuke you! Isn’t that pretty much what the Bible says too? God created everything. Doesn’t that mean there was nothing before? That really worked well in the 20th Century, didn’t it? It was hard work, but the atheist/humanist/religion-free murder count was kept at just under 100 million. Nice work! You should be proud. You need a trophy and a safe place to enjoy it. The data suggests we are living in the most peaceful time in history, despite the amount of violence today. The crusades were the more violent. We are slowly losing those tribal instincts – if only we don’t regress into them again under all this manufactured fear. Hilarious that you do not condemn the Muslim attempts to conquer all of Europe. Nor the wars of Muslim conquest when they drove almost all Christians from the Middle East and North africa. Only the crusades, which were defensive in measure, caught your attention. HIlarious. Hilarious that you think I don’t condemn Muslim attacks in Europe (I do…). Hilarious that you think I don’t condemn ALL wars as the work of the devil. Hilarious that you play blame games with what may be the defining impending war to end us all. Hilarious that you can’t see that that’s actually possible to put ALL violent terrorists, whether white supremacists or ISIS, in the same category of ‘terrorist’ and that there is no need to be tribal about it, or like a 5 year old saying “yeah but he was bold too so…”. The data shows the Crusades to be one of the most violent periods in history in terms of number of deaths – the data, not me. It’s not hilarious at all actually, it’s very, very, very sad. We need to evolve beyond this tribal mentality if we are to follow the teachings of Jesus Christ. Powerful leaders usually try to conquer any territory they can. That goes for nominal Christians as well as anyone else. And exactly how were the Crusades defensive? Hilarious that you assume that I don’t condemn the disgusting, cowardly and sick attacks by pretend-Muslims in Europe (I do – just as much as I condemn the disgusting, cowardly and sick attacks of pretend-Christian neonazis and white supremacists). Hilarious that you assume I don’t see ALL violence as the work of the devil. Hilarious that you don’t think it’s possible to see ALL those who want to spread fear either through hate-speech or through actual violence as belonging to the same category – “terrorists”. Hilarious that you play a blame game in what may be the defining world war to end us all. Fear begets fear, hate begets hate, violence begets violence. But it’s not hilarious at all – it’s actually very, very, very sad. If we are ever to achieve peace on earth, the best of us will rise above such tribal mentality and follow the directive to love each other from Jesus Christ. Wow – this comment was removed twice now, and for the life of me I can’t think of a single reason why other than the moderator didn’t agree. So, lets try again and see if I can figure out ANY other reason to remove it by trial and error. HILARIOUS you think? Got a good chuckle out of that? is it also hilarious that you assume I don’t condemn the cowardly, disgusting and misguided attacks by pretend-Muslim extremists in Europe? (I do – just as much as I condemn the disgusting, cowardly and misguided attacks by pretend-Christian white supremacists). Is it Hilarious that you didn’t consider the possibility of putting ALL hate-speaking and/or violent extremists into one category of ‘terrorist’, regardless of which perceived ‘side’ they are on? Is it hilarious that the threatening war, unless we rise above tribal, hateful attitudes, may be the defining one that ends us all, given the nuclear arsenal amassed since the last world war, and the increasing irrationality and anger in the discourse, and the continuing breakdown of long-standing historical allies across the world? Because I don’t think it is funny at all. I think it’s very, very, very sad. The best of us will rise above such tribal mentality if we are to ever achieve peace on earth and love for all according to the teachings of Jesus Christ. And before the twentieth century, according to estimates I’ve heard, our American ancestors managed to kill 100 million or so Native Americans–without the benefit of twentieth century technology, too. I don’t think many of them were atheists. It appears you have multiplied the actual death toll of native Americans–admittedly tragic–by a factor of 10. See “Disease and Catastrophe” by David Walbert at learnnc dot org. Most of those were by the spread of disease–also tragic but not intentional. As always, Progressives must continue telling lies to keep the Big Lie’s hideous corpse from rotting right in front of our eyes. Atheism kills, and Progressivism poisons everything. And you have a hand in that. Granted, most of those deaths were because of disease. Some of those were deliberately spread, though probably a minority. Doesn’t absolve those who deliberately killed, anymore than it absolves the Inquisition of killing a whole lot of people in Europe. They weren’t atheists either. Granted also that Communist leaders were atheists. That wasn’t true of the Nazis. Hitler was never excommunicated from the Catholic church, though he certainly deserved to be. Atheists can be bad people, but so can religious people. I’d say propaganda poisons everything, and conservatives are at least as guilty of that as progressives. In all honesty, atheists are the ones that are not fit to serve. When they got into governmental power, they killed one hundred million people via Communism, which was based on atheism. No, sir, we have the historical proof of what happens when atheists take control. Because there is no check on what goofy ideas they can come up with, they can decide to murder millions, and they can decide to send millions more to the Gulags. No, we have seen what happens when those who engage in the fantasy of atheism get in power. Note that they abandoned reality, they erased people from history, and other bizarre actions. Atheists must be kept out of government at all costs, simply because they are the most ruthless unprincipled people ever to walk the earth. Kind of interesting that the atheist Communists, to say nothing of the Nazis, modeled their secret police, who did much of their killing on the Inquisition. It would be nice if the world were so simple that only atheists where murderers. Unfortunately, things are more complicated than that. Sanders’ is an anti-Christian. That means he won’t support anyone he thinks is going to live by, and govern by, Christian morality. It isn’t realistic to expect Sanders to behave differently. He’s a liberal. We should expect him to act like one. Sanders is not anti-Christian – he has worked well with Christians on Christian causes throughout his life, and gets on well with the Pope. His objections were to Vought’s willingness to to fire a Christian woman for posting a kind message to Muslims on facebook, and Vought’s anti-Muslim written statement in support of firing her. The constitution requires that all faiths are treated equally by government without bias. This story proves you wrong. If Sanders was not anti-Christian he would have no problem with what Vought said. Neither would you. If the Constitution requires the government to treat all religions equally, then Sanders is violating the Constitution. No, I am Christian, but I have a problem with Vought being in office if he’s OK with firing a Christian woman for posting a nice message to Muslims on facebook, and I doubt he is fit to serve or likely to treat Muslims as equally deserving of funds as everyone else, if he considers them ‘condemned’. This automatically rules him out because he can’t be biased like that in his work. LIke most leftists, you distort what Sanders was talking about. He demanded to know whether Vought believed that Muslims were condemned to hell by virtue of their religion. He sought to ridicule the Christian doctrine that those outside the church have a more difficult time getting to heaven. This was not about saying something nice about a Muslim woman. My God, you fake christians will say anything. Although Muslims don’t accept Jesus as the Messiah, they do accept him as a prophet, which is more than Christians do about Muhammed. To say what Mr. Vought did, in my opinion invites people to discriminate against and persecute anyone who happens to disagree with the Christian point of view. Christians used to be persecuted. Some still are. Shouldn’t Christians behave better than that, and leave it to God to decide who is worthy and who isn’t? Muslims do not accept Christ as He actually is, but rather as someone lesser than the reality. If they deny His deity, they are ignoring His actual words. Mohammed basically piggybacked onto Judaism & Christianity. ARE they his actual words? Those words are in one of the Gospels, but not the others. We don’t have the original manuscripts of any of the Gospels, and it seems pretty clear that they weren’t written by the people whose names are on them. And would you believe me if I claimed to be a deity? You are wrong, Sanders was referring to an article Vought wrote in support of firing a woman for posting a message of love to Muslims on facebook – it was that article that contained Vought’s statement that he believed all Muslims were condemned to hell. Don’t question my faith. You are not God, and your comment very clearly goes against the stated policy of this site. I am also not leftist. You assume far too much in your anger. That’s the problem with anger and aggression – it prevents clear though. Sanders should have questioned Vought very specifically about the incident if he thought it involved something illegal. But, instead he questioned him about the specifics of his faith. And, declared that faith unworthy of holding office. It’s so utterly obvious that he violated the constitution. I disagree that you are a real Christian. And I know that Sanders would never support anyone he thinks is a real Christian. Then you are doing exactly what you accuse Sanders of. You are not the rightful judge of anyone – that is God. Sanders supports the Pope. Great letter, true words, well put! Well said brother! This an excellent respectful response. You can’t be a socialist and a christian, no way around that “thou shalt not steal” or “not coveting your neighbors whatever” those are literally what socialism is all about. Fiona must respectfully disagree with you on this. What Jesus commanded was community not socialism. The context in which He says these things is that the people should willingly give and share with others who have less. Socialism says that the government should take and distribute to others if you have more than they do. If something is taken from someone and given to someone else unwillingly then that is theft and that goes directly against what scripture teaches. We are called to give cheerfully and willingly as an offering of worship to God. This is why the church is in the state it is in. It believes that government can take the place of the commandments of God to His people which is simply not true. Well, I never heard Sanders say that rich people should be robbed, and it always surprises me how rich Christians often cherry pick like crazy about what Jesus said – ignore parts they don’t like – e.g. Jesus’ *directive* to give their excess property to the poor, and then obsess about other things Jesus said that serve their needs. Its almost like they think they know better than Jesus which bits of his teachings are *really* important…. It’s absolutely ridiculous to consider paying tax as theft. It is not. If you decide you want to use government funded roads/schools/hospitals, then tax is definitely not theft, but NOT paying tax while everyone else pays for the services you use – such as Trump brags about – IS THEFT. There’s a lot of cognitive dissonance about that. I guess that’s why Jesus said it’s harder for a rich man to get in heaven than for a camel to pass through the eye of a needle. I guess this is why the Pope said Trump is not a Christian. That and bragging about grabbing women in their private parts. But many Christians are too good at the cognitive dissonance thing, and are led by this orange ‘false prophet’ because they are scared they might have to share their wealth a bit. Awful situation. Your sick, sad interpretation of Christs words as demanding that GOVERNMENT take away hard earned money from some, and give it to others, is in effect a form of theft. Jesus never said a thing about government taking from some and giving to others, which is what you advocate. He left it up to each individual to make that decision. The rest of your comment is just standard leftist blow hard nonsense about how Christians disregard the passages of the bible. Well, that is exactly what you are doing, distorting the bible in pursuit of your creepy political aims. Jesus did say to render unto Caesar that which is Caesar’s, in the context of whose face was on the coins used to pay taxes. I don’t recall that he said how the taxes should be used. What do YOU say tax money should be used for? Why should he have objected to the government helping the poor? I personally think taxes should be used for the benefit of all, but many people disagree. Sticks and stones. Your tone and aggression are not worth responding to further. I see clearly you are not a peacemaker, and I’m only interested in discussion with those who are. If people want to give away their property voluntarily, that’s fine. The property is theirs to do with as they please. But having the government take your possessions to give to someone else is not fine, and should never happen. The US Government and state government already do far too much of that. So you disagree with the concept of tax in general? Socialism is an evil idolatry that always ends in slavery, poverty, misery, cowardice and death. It is a Big Lie about human nature and a worship of government in the place of God. Fiona, or Anne, or Tasha, or whoever you are, repent of your sins while there is still time! You don’t really say *why* anything you say should be considered true, or give any evidence or argument here, just your opinion as though it were fact. That’s pretty childish…adults are supposed to have developed the ability to reason rather than say ‘because I say so’. The only childish one here is you o twisting the words of Jesus to pretend that the government should take away goods, rather than an individual thing which is what the words say. Such childish attempts to twist the words of Jesus are typical of leftists. Fiona (I know it’s a name in Ireland) or whatever it is you’re to be called (the lady doth protest too much), you misunderstand much. One would think that the nearly 100 million murdered in the 20th century by socialism (now called Progressivism) would be sufficient evidence even for you. But you can go read about it in “The Black Book of Communism,” or any of Solzhenitsyn’s works, or Richard Wurmbrand’s, or Corrie Ten Boom’s, or Dietrich Bonhoeffer’s, or Brother Andrew’s, or Marvin Olasky’s or David Horowitz’s. Further, were it not for the greatest Christian, capitalist nation that ever was, that protected all of you from the Red menace for the last 60 years, your weak social democracies would long ago have been swallowed up. On the international scene, you are a trust fund baby, thinking yhu obtained this wealth and freedom by your Progressive “virtue.” In reality, it is in spite of it. Your arguments are pathetically weak, and you are in a pitiable state of deep intellectual, spiritual and moral poverty. But God will forgive your sins, as he has ours, if you will humble yourself and ask him to cover you with the cleansing blood that Jesus shed on the cross for you, and me. Anyone who claims Jesus was a socialist knows nothing about Jesus. Jesus did not say that the GOVERNMENT should take away your goods and give them to another. He very clearly referred to what individuals should do. Very sick that anyone would claim that Jesus advocated the most regressive economic system the world has ever seen. ….in your opinion. Which is no more valid than mine, or the Pope’s. Based on Mr. Sanders statements he should be denied the right to vote on anything or anyone. The law is clear that religious beliefs are not to be considered in these types of voting proceedings, Mr. Sanders violated the law willfully, knowingly and publicly, as well as the personal rights of the individual being interviewed. Mr. Sanders proved himself untrustworthy in adhering to the law. As a public servant who took an oath to uphold and defend the law, Mr. Sanders must be held accountable.